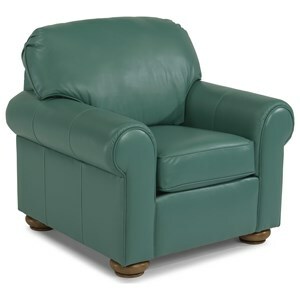 This piece combines elegant style with top-of-the-line comfort, giving you a quality seating option for your living room. From a stylistic standpoint, you're getting a traditional look that is created with tasteful bun feet. A sectional like this can quickly become where you spend most of your downtime, whether you're taking a nap on a lazy Sunday afternoon or gathering with your friends and family for a night of fun, this piece will never disappoint. The Preston Traditional 4 Seat Sectional Sofa by Flexsteel at Powell's Furniture and Mattress in the Fredericksburg, Richmond, Charlottesville, Virginia and Maryland area. Product availability may vary. Contact us for the most current availability on this product. 3538-23 Full Wedge 1 42" 42" 38"
3538-27 LAF Loveseat 1 60" 37" 30"
3538-28 RAF Loveseat 1 60" 37" 38"
The Preston collection is a great option if you are looking for Transitional Traditional furniture in the Fredericksburg, Richmond, Charlottesville, Virginia and Maryland area. Browse other items in the Preston collection from Powell's Furniture and Mattress in the Fredericksburg, Richmond, Charlottesville, Virginia and Maryland area.